The Premier Tech Aqua and Ecoflo story: Water is life. Let’s preserve it. - Times Publishing Newspapers, Inc. The Premier Tech Aqua and Ecoflo story: Water is life. Let’s preserve it. Out of sight and out of mind – does this describe your relationship with your septic system? If you are like most homeowners, you probably never give much thought to what happens to what goes down your drain. Well, at Premier Tech Aqua (PTA) what becomes of what goes down that drain has been a passion for the past 30 years. Badly treated wastewater coming from households contaminates wells, negatively impacts public health and safety as well as the quality of our lakes and streams, and the health of the aquatic life. Water is life and participating to its preservation is driving the passion of all our team members. The year was 1989 and Premier Tech had been expanding naturally for decades thanks to various technology-oriented aspects of sphagnum peat moss exploitation. A question was raised: can such a media purify domestic wastewater? So, the original idea was to create an ecological septic system treating wastewater from households in the simplest manner and at the right cost. What does this mean? Not only would this septic system meet the most stringent environmental requirements but it would be compact in footprint for more enjoyment of the property, using no electricity for treatment, very easy to install and to use. And best of all, its filtering media purifying the wastewater would be a 100% natural and safely composted or amended at its end of life. Twenty-five percent of the US population is not connected to sewers, and good soils to build on are scarce. Water supply is limited and water quality is declining at a rapid pace and affecting public health safety. Homeowners need to protect the investment of their property. ECOFLO is the septic system of choice for you. Sewage is backing up into your house or terrible odors are overcoming the backyard and now you know something is wrong with your septic system. Or you just learned from your local SEO that your home re-modeling project involves replacing or updating your existing system or that new home you’re planning to build or buy will need one. Yes. You’ll face some big decisions about whether to repair or replace the equipment. So, you’re asking yourself: Why? How come? What do I do now? Where do I start? 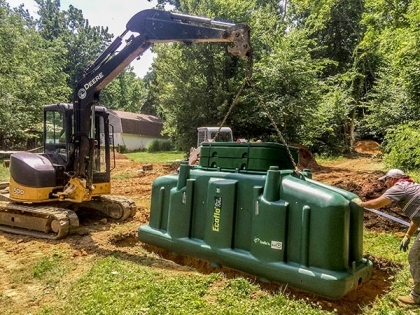 In Pennsylvania, for over 21 years now, Premier Tech Aqua has seen thousands of its award-winning ECOFLO Septic System recommended and installed. Thye have developed and trained a large network of professionals who are familiar with their products and services such as designers, excavators, sewage enforcement officers and service providers that accompany homeowners on a journey which will also contribute to preserving water. Here in Bucks County, PTA has been working for many years with professionals such as Penn’s Trail Environmental LLC., VW Consulting, Damiani Septic & Excavating and Bauer & Sons, to name only a few. And because investing in local production and assembly of the ECOFLO Septic System is key to their culture, they are proud to have grown alongside Monarch Precast Allentown and M&W Precast & Construction Supply. As an additional step to enhance customer experience in Pennsylvania, Premier Tech Aqua is running a full operating office in the City of Quakertown, which hosts Team Members supporting Sales, Customer Service and After-sales services. Premier Tech Aqua is committed to be a global leader in its industry while working locally with communities, professionals, businesses and homeowners. The Quakertown office strengthens the company’s continuous improvement spirit and the will to keep serving better its clients across the state. The demand for its ecological septic system ECOFLO keeps rising and so the need to bring in additional team members. PTA welcomes candidates that see themselves as a defender of the philosophy of long-term sustainability and that believe in doing what they can to contribute at preserving water because “Water is Life”! Premier Tech Aqua is located at 200 Kelly Road, Unit B, Quakertown, PA 18951-4226. Call them at 1.800.ECOFLO.